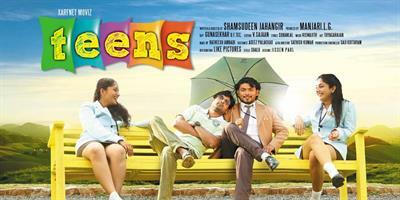 Teens malayalam movie directed by Jahangir Shams is a colourful movie told on the background of a campus. Produced by Manjari L G under the banner of Surf Net Movies, the movie features Sajith Raj, Divyadarshan, Swapna Menon, Sonia in lead and Madhupal, Kalasala Babu, Sathar, Ganapathi Niyaz Becker in supporting cast. With the post production completed, the movie will be released very soon. Get ready to welcome yet another campus movie which is flovaoured with suspense and jubilation. Set on the backdrops of an engineering college, debutant Jahangir Shams tells a beautiful story which can mesmerize the young movie lovers. Titled 'Teens', the movie will be a visual treat for the fun loving young generation which is coupled with beautiful songs and moments to thrill. Teens tell the tale of true friendship, which we all have experienced in college life. Roy (Sajith Raj) and Vivek Krishnan (Divyadarshan) are good friends who are pursuing their degree in engineering at St Rose College of Engineering. Vivek is nicked named as 'Member' as being the son of an ex-MLA. Roy and Vivek enjoy their campus life at its maximum giving out all the naughtiness they could commit. Sruthi Menon (Swapna Menon), a village girl joins the college as a first year graduate. Coming from a rural environment, Sruthi is truly fascinated towards the posh and attractive campus life. Vivek hooked by the innocence and beauty of Sruthi get close to her and later they become friends. Their relationship was not kept to secret as it spread like fire and become becomes the talk of the campus. Mercy Chacko (Sonia) with a jovial character is a fourth year student who has many fan followers in the campus. After the initial faceoff, Mercy and Sruthi became close friends. Things were not fine as unconventional events occur in the campus. The thrills of the colorful campus life and the incidents followed contribute to the rest of the story. Written and directed by Jahangir Shams, the movie is being produced by Manjari L G under the banner of Surf Net Movies. Young brigades Sajith Raj, Divyadarshan, Swapna Menon and Sonia would be donning the lead roles while Madhupal, Kalasala Babu, Sathar, Ganapathi and Niyaz Becker in supporting cast. With the post production works over, 'Teens' will be releasing in May 2013.